Virginia forward De'Andre Hunter, the star of the Cavaliers' magical national championship run in the NCAA Tournament, has declared his intentions to enter the NBA Draft and says he will hire an agent. 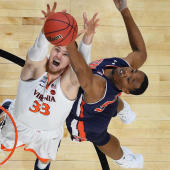 Hunter, a 6-7, 225-pound redshirt sophomore, scored a game-high 27 points in the Cavaliers' final win of the season: an 85-77 overtime triumph over Texas Tech that have UVA its first basketball title. In just his second season playing under Tony Bennett, he averaged 15.2 points, 5.1 rebounds and 2.0 assists per game. Hunter is the No. 5 projected pick to the Hawks in Gary Parrish's latest mock draft. Hunter piqued the NBA's interest last year when, after redshirting the 2016-17 season, he burst onto the scene with a freakish physical profile. Playing in less than 20 minutes per game, he flashed incredible defensive versatility and floor-spacing with his accurate 3-point stroke, displaying all the signs of what a plug-and-play swingman can be at the next level. Hunter improved in virtually every category since last season and is now a projected top-10 pick in this year's draft. He shot 43.8 percent from 3-point range and 52.0 percent from the floor, and in his final test of the season -- a head-to-head matchup with projected top-10 pick Jarrett Culver -- he passed with flying colors. Hunter is the second starter from Virginia's title-winning team to declare this week joining teammate Ty Jerome, who is also a projected first-round draft pick.